Flight Display Systems has introduced two updated displays engineered specifically for military and law enforcement aircraft cockpit retrofit. The displays, a 7in high-definition widescreen (FD70CV-M-C-1) and a 10in high definition widescreen (FD102CV-C-1), can now be configured for Night Vision Goggle (NVG) usage and Sunlight Readability (High Bright). This is the first time Flight Display Systems has offered widescreen monitors in 7in and 10in sizes with these capabilities. 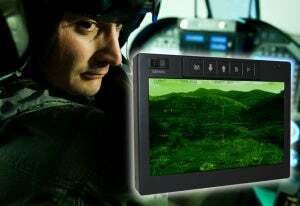 "Our clients look to us for advanced cockpit display solutions that provide NVG and High Bright," says David Gray, president of Flight Display Systems, "We’re thrilled to accept the challenge and offer these two outstanding products." High-definition widescreen monitors allow for more content to be displayed in a smaller space. Replacing outdated CRT displays and tiny LCD monitors offers a tactical advantage when making life and death decisions. To simplify planning and installation, Flight Display Systems has created Fly HD, an end-to-end system comprised of source equipment, backbone architecture and displays optimized for high-definition. Space is at a premium in most aircraft cockpits. Flight Display Systems has developed an entire line of monitors that can be easily retrofitted into small areas. Using precision engineered flip brackets (flippers) or arm mounts, the displays can easily be installed alongside existing instrumentation. Custom configurations are also possible through their knowledgeable in-house engineering team. The addition of the new 7in and 10in monitors rounds out an already broad line-up. Toggling a switch on the monitor faceplate changes the display back-lighting to a night vision-compatible mode. Otherwise, bright colors such as red, white and yellow can cause the auto-gain feature of night vision equipment to protect the system by reducing the level of light intensification. This reduction in gain leads to diminished visual acuity for the user. Colors used in display modes not optimized for night vision goggles can also create increased glare and reflection. Because most "off-the-shelf" LCDs don’t operate efficiently in direct sunlight, Flight Display Systems’ High-Bright displays are engineered to operate in extreme ambient light conditions. Both the FD70CV-M-C-1 and the FD102CV-C-1 support composite video, VGA and DVI-D single link inputs and operate on 28V DC power. Controls are conveniently mounted on the front of the bezel. The 7 inch FD70CV-M-C-1 has a native resolution of 800×400 pixels and supports 640×480 through 1024×768. The 10 inch FD102CV-C-1 has a native resolution of 1024×600.